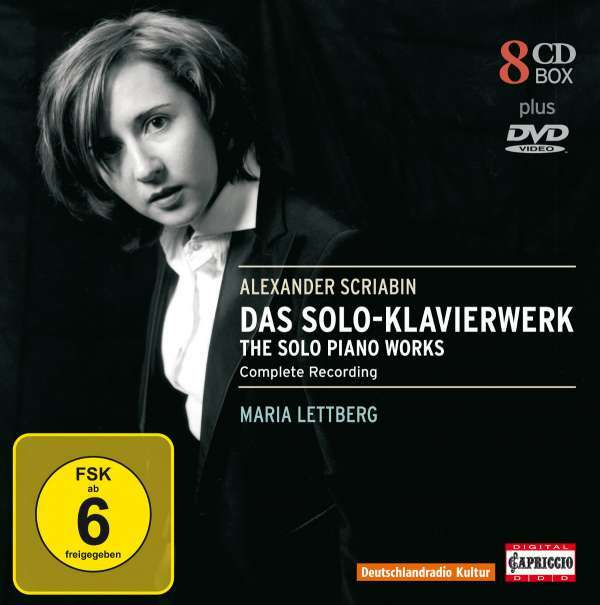 Der Artikel Alexander Scriabin (1872-1915): Das Solo-Klavierwerk wurde in den Warenkorb gelegt. Diese Box stellt eine absolute Katalogneuheit dar: auf acht CDs spielt die junge schwedische Pianistin Maria Lettberg das gesamte Klavierwerk des jung verstorbenen, genial-exzentrischen russischen Komponisten Alexander Scriabin. Seine Musik fußt in der romantischen Tradition von Chopin, Scriabin entwickelt aber immer stärker eine eigene Tonsprache und bezieht philosophische Theorien in sein grenzüberschreitendes Universum mit ein. Auf der Bonus-DVD sind faszinierende Visualisierungen von Scriabins Musik zu erleben – der Komponist verband seine Musik mit Farbverläufen, die hier von der Designerin Andrea Schmidt umgesetzt wurden. Hörprobe Track 3: Sonate für Klavier Nr. 7 op. 64 "Weiße Messe"
Sonate für Klavier Nr. 7 op. 64 "Weiße Messe"
Hörprobe Track 5: Sonate für Klavier Nr. 9 F-Dur op. 68 "Schwarze Messe"
Sonate für Klavier Nr. 9 F-Dur op. 68 "Schwarze Messe"
A necessary basis for Scriabin's fans. 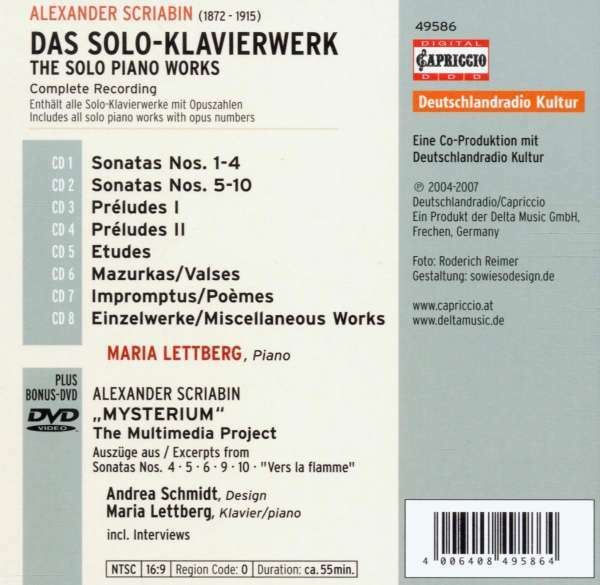 This integral provides very nice recordings of the piano music of Alexander Scriabin. The interpretation of this composer offers a wide variety of choices and the discography reflects that. I am not an expert in musicology and I respect the options of every pianist. I could prefer recordings of some pieces by other pianists (Piers Lane, Amoyel) but the interpretation of Maria Lettberg remains very attractive for me. For a reasonable price, we have a complete set! The formidable interpretation of Scriabin’s music. Scriabin’s music considered one of the most challenging in the piano repertoire. Ms. Lettberg shaped each piece into something beautiful behold polished, transforming from the toweringly powerful to the sweetly magical, articulated the trickiest of passages, rendered with power and rich tone. You can see that she completely identifies with the emotions of every note. This is breathtaking pianism which remains among my favourites: Vladimir Horowitz and Marc-André Hamelin!